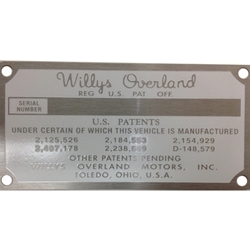 PATENT DATA PLATE FENDER WELL JEEP. WHITE BACKGROUND. US AJP MANUFACTURE. Plate, name, patent and serial number right wheel house panel. AJP production. Best repro avail. Correct .016 aluminum per factory. Stamping avail for 15.00 additional charge. Copy of title or bill of sale must be provided for this service. Plate included mnting screws.